So after a little trial and error here are the pattern details for a crocheted Mother Bear hoodie. Crochet the bear pattern as desired using the Mother Bear authorized patterns found at their website here. It is important to buy and use their patterns as this is a very vital part of the organizations funding to be able to provide love through either a crocheted or knitted bear to children in other countries that are affected by HIV/AIDS. After completing the crocheted bear, I then added the crocheted hoodie by making the hood separate. With a G (4 mm) hook, chain 33 and then double crochet (DC) into the 3rd stitch from the hook and in each chain down to the end. The strip should be about 8-1/2 inches long as you work the rows for the hoodie. Row 2-8 Ch2, turn. DC in each stitch of row. Repeat until 8 rows are completed. Strip should be about 4-1/2 inches long by 8-1/2 wide. Fold hoodie in half with the starting chain at center back and whip stitch hood closed. Attach at front sides of bear as shown in photo. I used a piece of yarn to hold the hood in place at each side of the neck and one at center back. My hood fit around the neck area fairly flat and even. Using a larger yarn needle, I wove through the hoodie into the neck to attach the hood to the bear. I should say that I did not cinch this bear’s neckline before attaching the hood and found that after attaching the hood it tightened up the neck enough that I did not need to cinch the neckline as the original bear pattern calls for. In November 2016 I added a new option for ties on my hoodie. With the help of another Mother Bear crocheter on Ravelry, TeaLover, I added instructions for the ties. 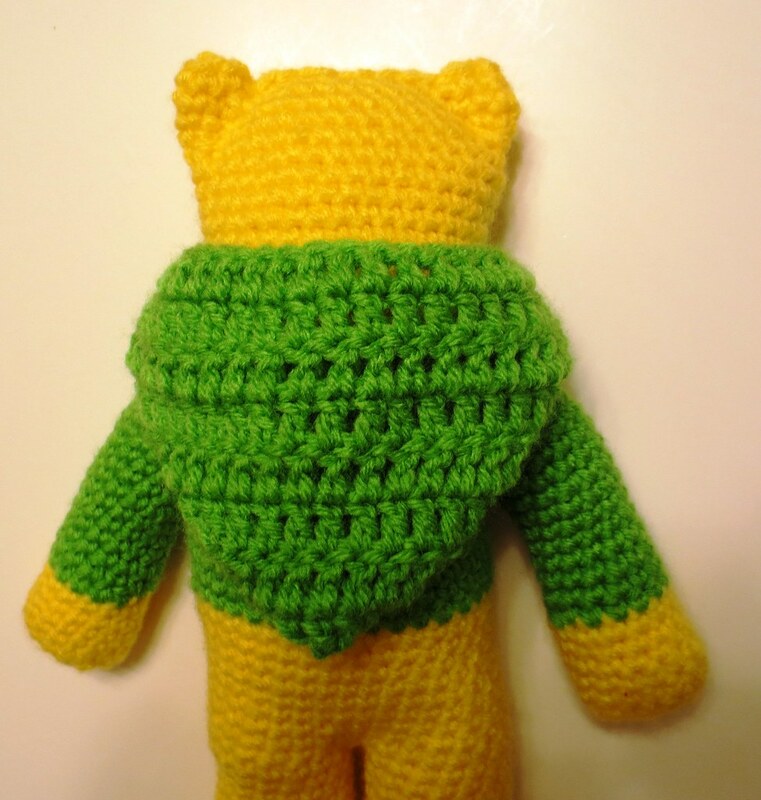 The ties create a built in scarf on the bears. You can find this option for built-in ties here. 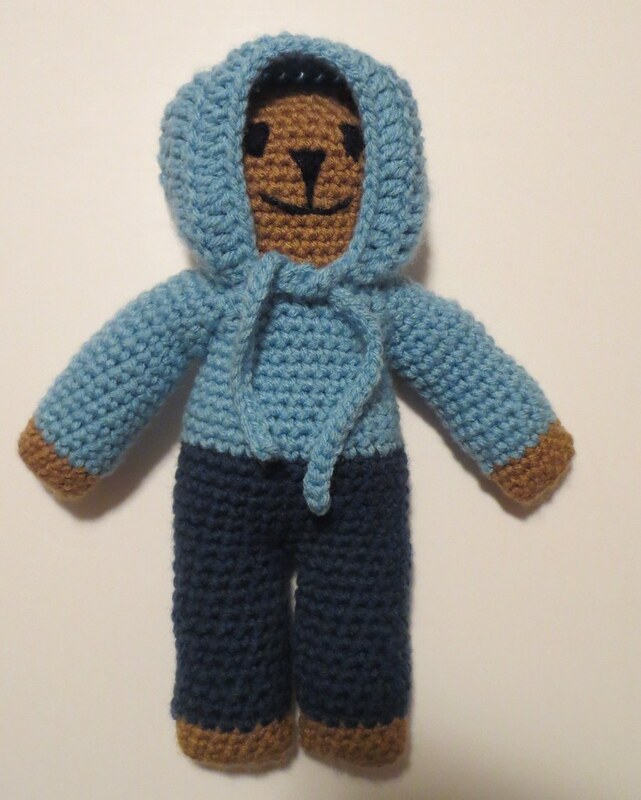 Here is the back photo of the Mother Bear hoodie I crocheted and added to my bear. 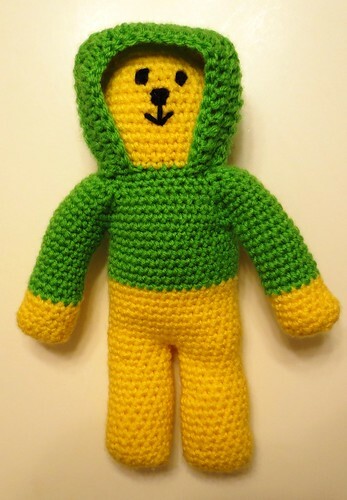 Here is Mother Bear Mellow Yellow with his hood down. Isn’t he just cute? 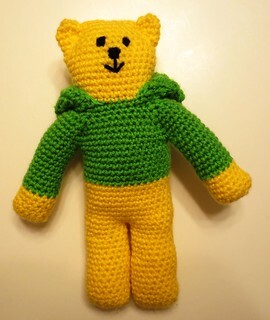 I can’t wait to see a photo of a child just loving on my crocheted bear. I love that you always share your crochet knowledge so freely and happily. Christina – Thank you so much for your nice comments. I am always happy to help others and love to share and promote crafting here.